I've sent millions of messages and not a word from my ISP. An all in one bulk email program. No more hunting mail servers or open relays for me. Q: I got error message "Failed to query MX server of somedomains.com" when I was trying to send e-mail. A: This means you need to enter a right DNS server address. 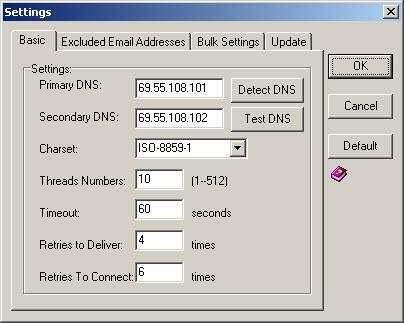 Click [Settings->Detect DNS] to detect your local DNS settings. Please use following dns server if your local DNS server didn't work. It is one line per DNS server. After entering, you need to click button [Settings->Test DNS] to check if it works on your PC. And then, click [OK] to save settings. If all the dns can't work on your net environment, you need to ask your ISP(Internet Service Provider). "What is our local DNS server address?". And then enter your local DNS server. Below is the settings windows. To open Settings windows, you need to click [Settings] button on the main interface of our application.